Rome. Bangladesh. An abandoned island off the Irish coast. 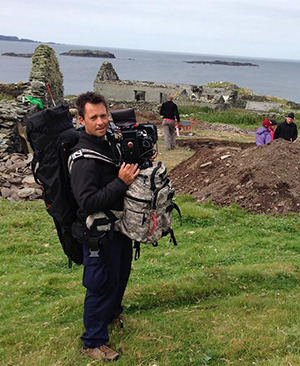 These are just a few of the locations where William Donaruma ’89 has traveled as a filmmaker and teaching professor in Notre Dame’s Department of Film, Television, and Theatre (FTT). “Nothing beats experience and pushing yourself beyond your comfort zone,” Donaruma said. One of Donaruma’s most recent film projects premiered in Rome as part of an exhibit called “Revisiting the Roman Forum: from Pen to Pixel, Methods of Documentation in the 20th and 21st Centuries.” The exhibit, part of The Digital Future of World Heritage symposium, ran from April 4 through Oct. 31. Donaruma’s film documents the innovative work of the Digital Historical Architectural Research and Material Analysis (DHARMA) research team based in Notre Dame’s School of Architecture. In partnership with the Sopritendenza Speciale Beni Culturali and Rome’s Ministry of Culture, DHARMA combined detailed historic texts and drawings with traditional hand-measuring techniques and new digital technology to document the Roman Forum in 3D for the first time. 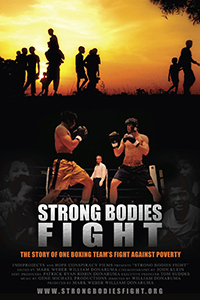 In 2008, Donaruma’s work took him to Bangladesh as director and co-producer of Strong Bodies Fight, an award-winning film about the University of Notre Dame’s Bengal Bouts charity boxing tournament. The annual event has raised more than $1 million since the 1930s to support Congregation of Holy Cross missions in the poverty-stricken nation. Mark Weber ’09, who majored in FTT and the Program of Liberal Studies, approached Donaruma about the project while serving as student president of the Notre Dame Boxing Club. The film chronicles the transformational experiences of five student boxers who traveled to remote villages in Bangladesh to see the missions’ impacts firsthand. Since 2012, Donaruma has also partnered with Notre Dame anthropologists on a project called Cultural Landscapes of the Irish Coast, which focuses on the abandoned island of Inishark as “a window” to Irish life in the 19th century. 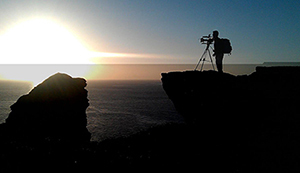 “Some people think they experience Ireland by taking a trip to Dublin, but this is the real Ireland,” he said of his experiences on Inishark and the nearby coastal island of Inishfobin. Donaruma has made a total of nine short documentary videos for the project to date. He was also on the two islands in May, assisting with 3D scans of Inishark and shooting pieces on Inishbofin for the upcoming book Island Lives, Island Places. Some of the videos are available on Donaruma’s Vimeo page. Donaruma is also working with Anthropology Professor Ian Kuijt on a team-taught class that will incorporate ethnographic documentary and focus on the work they have been doing together in Ireland. Ireland is at the heart of another of Donaruma’s myriad projects—Hear My Heart, a documentary he’s been working on for several years that examines the spiritual side of the band U2. “The project is really a labor of love that my wife still gets on me about pushing forward,” Donaruma said. He also was behind the camera on NightLights, a short, fictional drama that premiered in Los Angeles in August about a young woman raising her autistic adult brother. He worked on the film with former FTT student John Klein ’06. “It was a great experience doing that movie, working with John, and seeing how it progressed,” Donaruma said. “Fiction work is really a passion that I want to push further in the coming year,” he said. On campus, Donaruma directs the Center for Creative Computing, and teaches an intermediate filmmaking course called Digital Cinema Production. “In class, I also emphasize what it takes to succeed working in various positions on a set or working independently,” Donaruma said. Originally published by Mike Danahey at al.nd.edu on November 06, 2014.